Unfortunately, though, my Quasi-Evil Plan to have some crossword themed custom fabric printed went awry (through lack of planning on my part — I didn't leave enough time to get both the fabric AND the dress made). So, I wondered, what else could I do? I can't remember what pattern I used — some vintage 1960s Simplicity thing — I can dig up the number if anyone's interested. The black and white fabrics are both quilting cottons (which, in part, explains how rumpled and mussed it looks — that stuff is a pain to iron!). The black lines are black bias tape. 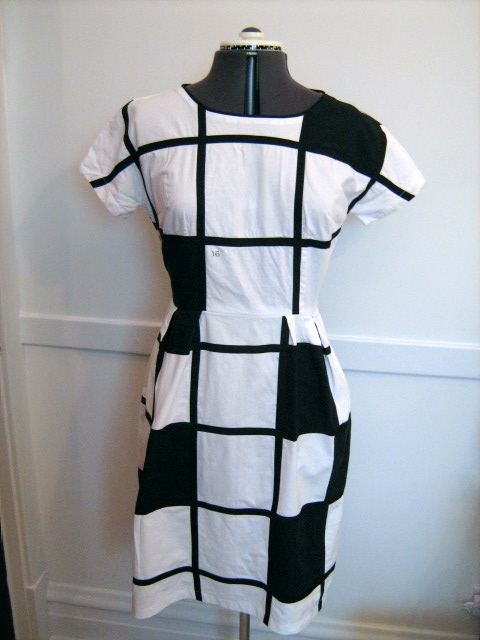 What I did was cut out all the dress pieces and do about half the construction — darts, the major seams of the skirt — and then put on the black squares, which are secured to the white fabric by the bias tape. I would have tried harder on the back, but I was still finishing it very late the night before we left, and the only zipper that was right length was an invisible one, and nothing on earth will make me take out an invisible zipper once I have it (mostly) in. My rationalization was "It's Brooklyn in February; I'll be wearing a cardigan over it anyway." Any ideas for what I should do next year? how cute!! I think it is a “felix culpa” that you couldn’t find crossword-themed fabric. Next year, I would go for separates. Perhaps a skirt and scarf crossword print and a black sweater.OR- A red dress with white crossword appliques (and the black bias tape borders) spelling out things like “Winner” to intimidate your competition. And red shoes. (I am big on red shoes lately- take that for what its worth). What a clever idea! And you have more patience than I do, laying out all those lines of bias tape. OOPs I think I typed my comment with my eyes closed! Sorry! What a brilliant concept! I could tell you how to get all the squares to line up; I am a quilter and I know these things. But how inspired! Brava! That’s great! No matter about the no-match there at the back. Maybe these bangles, made out of black pencils, would go well with the ensemble? http://www.dezeen.com/2007/07/05/pencil-jewellery-by-gemma-holt/(In case that address is too long, google Gemma Holt). Hope you were wearing a nice bright green or orange cardigan, by the way. Very cute! (I do like the gathered neckline on your dress from last year, though. )Perhaps next year you can pay tribute to the clues somehow. I actually went back to read that entry when I had time to concentrate…I think it’s amazing and it says something for your combination of patience/ambition combined with a tight deadline (is there any other kind? )Black bias tape – oh, the thought! Mine would have been sooooo much more squinty. Well done! *Love* the dress. 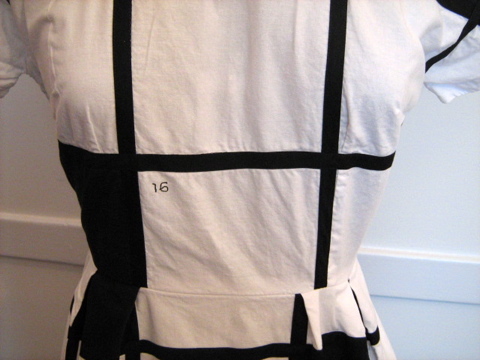 What about some of the alphabet fabric you have for trim or accessories next time? I think I read somewhere about turning magazine pages into fabric. 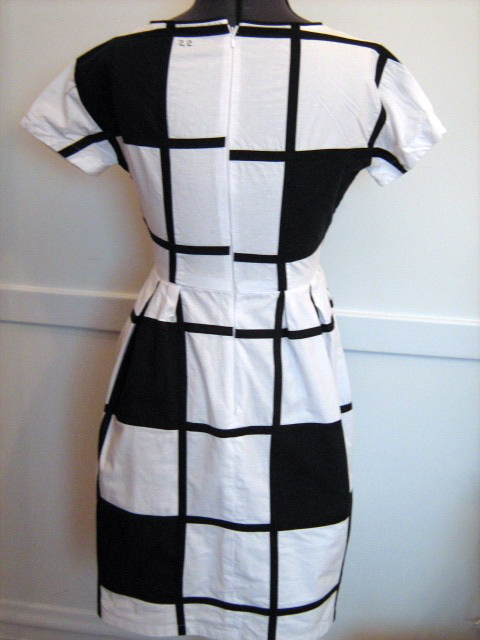 Can you turn newspaper crossword puzzles into fabric and use that to make a dress? Regardless of the matching/non-matching-ness of it, I love it. Lovely dress! I’m interested in what number the pattern is? Thanks! oh my! this is amazing. any chance you would sell it or make another one to sell? Thank you … but no. It’s not hard to make — you could do one yourself easily!